Wadadli "Our Island, our beer"
The Siboney were the first to inhabit the islands of Antigua and Barbuda in 2400 B.C., but Arawak and Carib Indians populated the islands when Columbus landed on his second voyage in 1493. Early settlements by the Spanish and French were succeeded by the English who formed a colony in 1667. Slavery, established to run the sugar plantations on Antigua, was abolished in 1834. The islands became an independent state within the British Commonwealth of Nations in 1981. The winter invasion of tourists is attracted by His Majesty's Antigua Naval Yard at English Harbour (built starting about 1725 and functioning still as a boat yard). 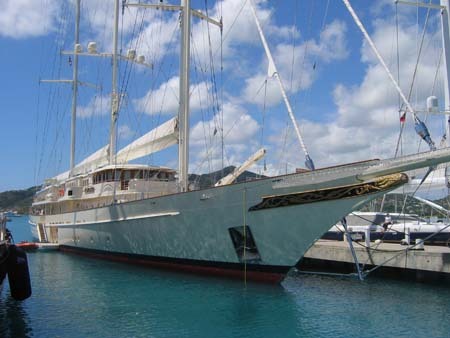 Particularly during Antigua Sailing Week (which actually last closer to a month) , Antigua is willing host to large number of the world's most fabulous yachts. Our favorites are the traditional boats of Antigua Classic Yacht Regatta for which there are both races and a Concours d'Elegance. 292' S/V Athena, Gaff rigged schooner. Antigua is dry and surrounded by reefs. There are a huge number of anchorages and sand covered beaches and one could easily spend a season sailing in these waters.